I finished the body on the still unnamed sweater jacket and then realized that I messed up a part of the increases, namely, I increased a bit too much for the bust section. It’s not a big deal, since it still fits me correctly, and I’ve fixed the error in the pattern, but it’s annoying to discover that my whole thought process about something was flawed. 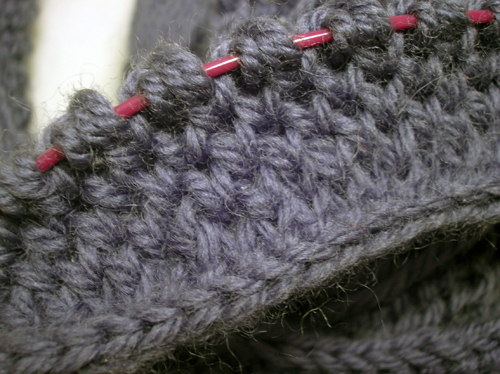 which are kind of necessary because the pattern, when knitted in the round, creates a kind of weird looking seam that I’d rather not have on this particular garment. I’m not sure yet how to fix that and have it still look nice and neat. 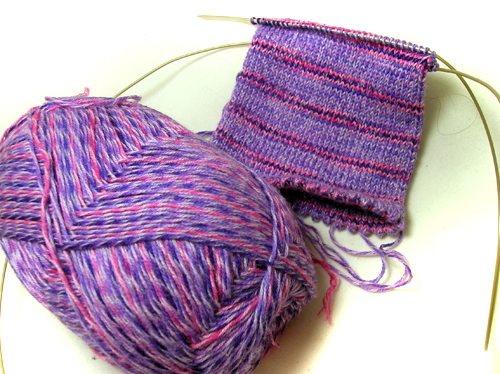 I have an idea or two but I think I might have to swatch to get it all sorted. So in the meantime, I’ve been working on something else. This pattern is so addicting. 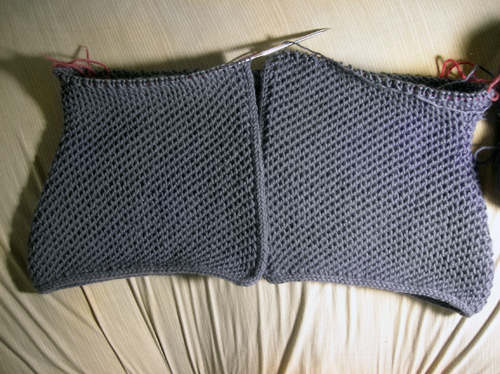 I’m getting a bit bored with the garter stitch at this point but I can’t put it down because I want to see which direction it goes in next. And I’m using some LL shepherd worsted and it is like butter. So deliciously soft. I think I should have this finished by tomorrow, considering how much I’m working on it. Here’s some late Caturday for you. I am the most indecisive person I know. I can never decide what to eat, what to wear, where to go, what to do when I get there, or when I should return. Obviously, this is a problem. I have been known to spend so long trying to decide on something that I miss the opportunity all together. But, I’m trying to change. Starting with… button choice. 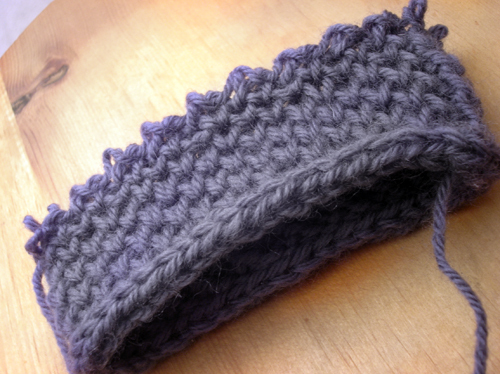 Or clasp choice, in this instance, for the sweater of unknown name. (Name choice is another problem, but I’m taking baby steps here.) I have a fair number of options out there, and although I can certainly choose what I like and what I don’t like, I have a hard time figuring out what I like and what would be perfect on this sweater. 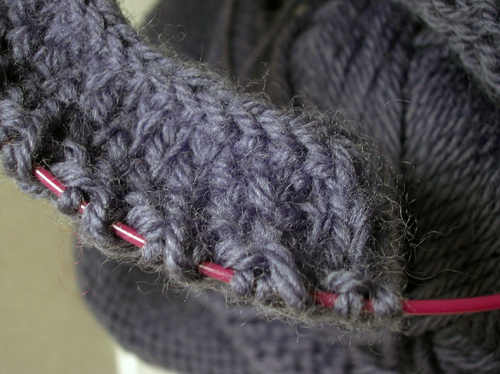 These gorgeous clasps would be perfect, except for the fact that buying enough for my sweater would mean the clasps costing potentially twice what the yarn for the sweater itself cost. These are a good deal cheaper, and gloriously plain, but perhaps they are too plain. These are SUPER cheap, and rather pretty, even if I can’t figure out how they close… and I’m not sure how good they would look on the sweater. I also like these, but I can’t remember where in the hell I got this picture from. I should have it up by tomorrow (I hope!)…. Yes indeedy, that’s what I did. What was I thinking? Actually, I was mostly thinking that my gauge had changed, and my decreases weren’t working. No photos of the new and improved jacket, since it looks the same, but smaller. I do have a video, though, of the i-cord cast on that I use. 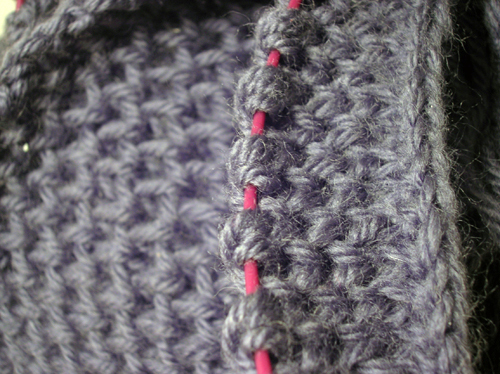 And by the time I publish the pattern I’m going to try to have videos of all the weird techniques that it will have up. There are a lot of them. 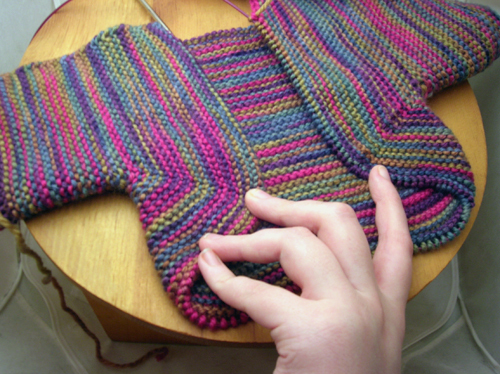 I also cast on for some pretty lacy knee socks, during the couple of days of indecision over frogging or not. 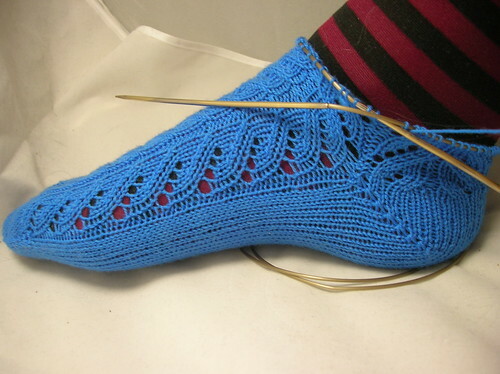 They’re an excellent travel/class WIP, because the lace pattern is nice and easy and repetitive. I just have to try not to get distracted by them when I should be working on the jacket. Ahem. Not that that’s happened, or anything. So I’m really going eleven steps backwards. Which is why there has been no blogging, because I am getting nothing done. and she likes it quite a bit. 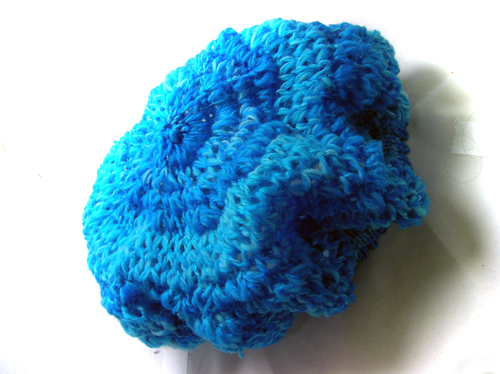 It matches the mini clap I made out of malabrigo ages ago, which I never wear, so I gave that to her as well. 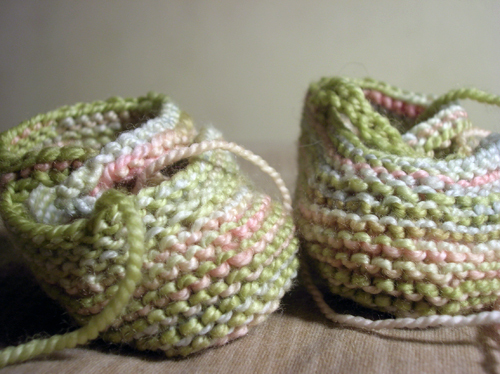 I also spent a couple of hours putting these adorable things together. They just need buttons now. But what’s really causing me agony is my sweater jacket. 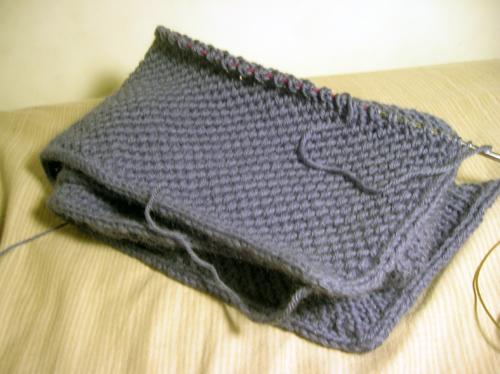 I have ripped and reknitted this thing so many times by now. And I still think I may need to frog the whole thing and start again. 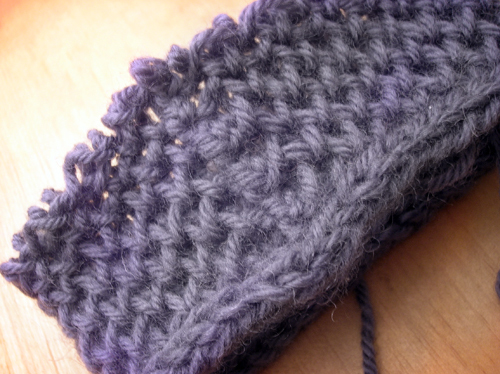 Or maybe cast on for something new while I try to figure out what the hell I’m doing. Whatever, you’re here for the Caturday, right? 😉 Well, we have a new member of the family, and it looks like she’s sticking around for a while. This pretty little kitty (who is actually huge–she should weigh 15-20 pounds once we get her up to a normal weight) is technically still our foster kitty, but my mum has fallen in love with her, and we may not be able to give her up again. She doesn’t have a name at the moment, although it seems everyone has an idea: mum likes Inertia, dad likes Velocity. I’m all for calling her Velociraptor. All suggestions welcome.